My colleague had to set this up on the test bench today, and it looked infinitely more interesting that what I was doing, so I grabbed my console cable, and offered to ‘help’. This was done on two Cisco Catalyst 3560-X switches, each with a 10G Service Module (C3KX-SM-10G), and 1Gb SFP modules (Note: Not 10Gb ones, this will become important later). 1. First hurdle was, when we tried to add the first command to the interface ‘cts man’ it would not accept the command, you need to make sure you are running either IP Base, or the IP Services feature set. with the IOS software version. Please update the software. Module is in pass-thru mode. 3. If you issue the following command, you can see the difference (highlighted). 4. So a quick download from Cisco later, with the file on a FAT32 formatted USB drive. 1. Notice I’m configuring GigabitEthernet 1/2 NOT TenGigabitEthernet 1/1, this is because I’m using 1Gb SFP’s, both interfaces are listed in the config! (This confused us for about twenty minutes). We are not using dot1x authentication, we are simply using a shared secret password (abc123). Note: This has to be a hexedecimal password i.e numbers 0-9 and letters a-f.
1. Configure MACSEC on both physical interfaces, before you ‘port-channel’ them. 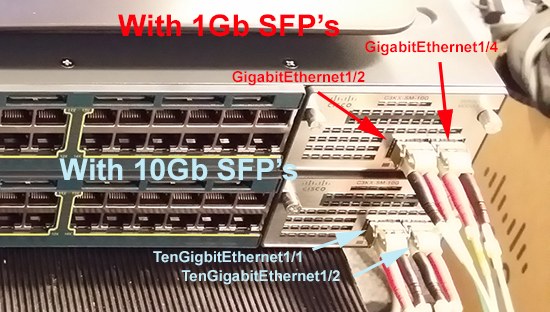 The second interface (when using 1GB SFP’s), is GigabitEthernet 1/4. Thanks to Steve Housego (www.linevty.com) for doing 97% of the hard work, whilst being slowed down by my ‘help’.